Keep practice or gym class equipped with an ample supply of balls using this Monster Ball Locker. 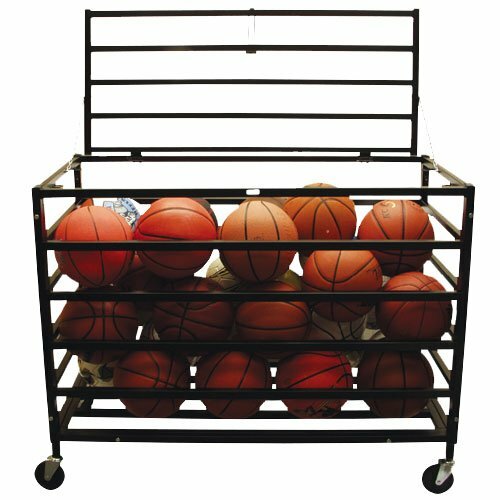 Capable of holding up to 30 official-size basketballs or 40 volleyballs, this locker will stand up to use all season long thanks to the powdercoat steel tubing construction. Roll the locker to any corner of the gym or wherever you need it on the oversize wheels that move smoothly over most surfaces. Young hands will stay safe as they reach for a ball, as the special hinges and safety chains prevent the top from falling over. Size: 47" L x 24" W x 37" H - 75 lbs.